I've filled cupcakes before, usually with my peanut butter, strawberry, or chocolate buttercream icing. I love trying new things, but for some reason "compote" just sounded a little intimidating. After our cherry tree harvest, we made a cherry pie but we still had a lot of cherries left over. They were sour cherries, so not exactly the best cherries to munch on. I decided to finally try making a compote and found it was a lot easier than I had expected! 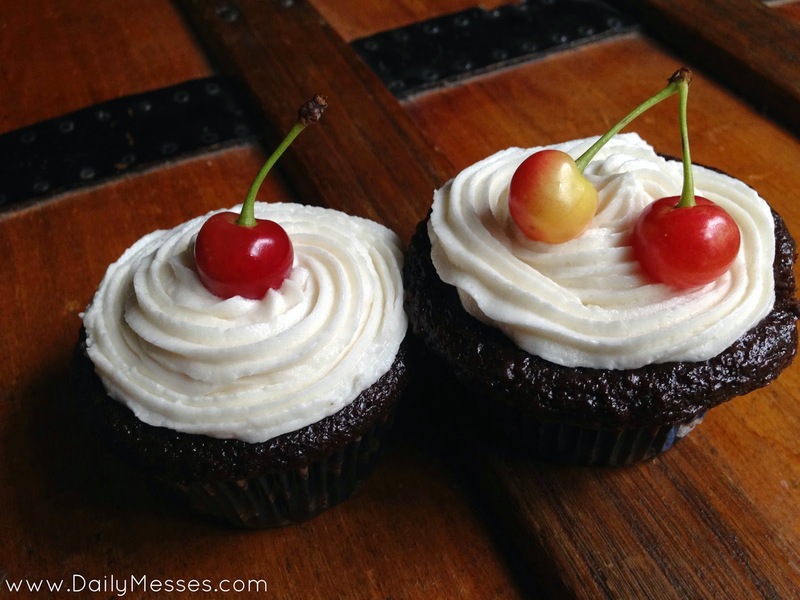 I made chocolate cupcakes and filled them with the cherry compote. I topped with a buttercream and they were delicious! 1. Combine all ingredients in a large saucepan. Bring to boil. 2. Reduce heat to medium-low and simmer for about 10 minutes, or until cherries soften and release juices. 3. Remove cherries with slotted spoon and set aside. 4. Continue simmering the juices until thickened (about 15-20 minutes). DM TIP: I used this as a cupcake filling, so I let the juices get pretty thick so the cupcakes didn't turn to mush. However, if you were using this as an ice cream (so good!) or pancake topping you might want it to be a little runny still. 1. We only really deal with pitting a lot of cherries once a year, so I don't want to buy a cherry pitter. However, we tend to have those wood chopsticks from sushi or Chinese food laying around. Pitting cherries can be a pain, but if you have a chopstick, it can be easy! Break apart the chopsticks, place one end of the chopstick in the center of the cherry and push through to pop the pit out! 2. Filling cupcakes is pretty easy. I had bought a cupcake corer, but found it didn't work as well as I had hoped. If you have an apple corer, I found it works a lot better! Place on the middle of the cupcake and push down, but make sure to not go through the bottom of the cupcake since you need a bottom to the cupcake so the filling doesn't fall out. Twist and pull up. The cored part should be in the apple corer and make great little snacks for "helpers".